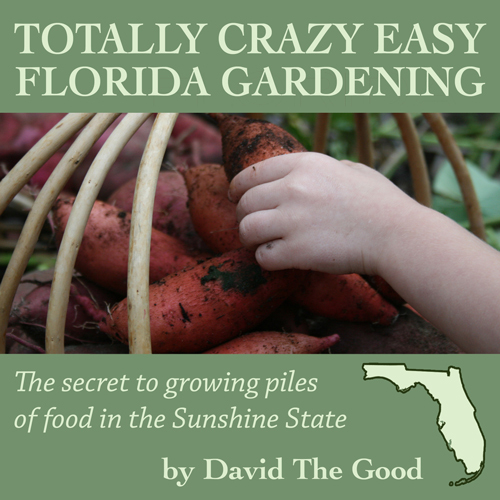 I finally got a chance to record and produce Totally Crazy Easy Florida Gardening in audiobook format! The audiobook versions of my books do well. Some people prefer audio and I like to reach everyone. I’ll be recording Push the Zone: The Good Guide to Growing Tropical Plants Beyond the Tropics in audio format next. A friend of mine has graciously lent me a quiet room in his house for recording purposes, as our place has no glass on the windows, making it way too loud between the sound of children, goats, birds, shrieking crickets and frogs at night, etc. Also – great news for those of you who wanted a paperback version of Push the Zone: it’s been formatted and should go live on Amazon within a week. Stay tuned. In related news, my presentation Seven Ways to Feed Your Garden for FREE airs tomorrow at The Homegrown Food Summit for one day only. Sign up here to watch my hour-long video, plus presentations by dozens of other gardeners and homesteaders. Push the Zone Still in the Gardening Top 10! My New Book “Push the Zone” is HERE!